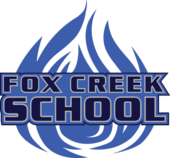 Fox Creek School is located in Fox Creek, Alberta. We are situated on Highway 43 approximately 250 kilometers northwest of Edmonton. With a school population of approximately 400, we offer educational programming to students from Kindergarten to Grade 12. Our school office hours are 8:00 am to 4:00 pm. Fox Creek School is under the jurisdiction of Northern Gateway School Division with Mr. Kevin Andrea Superintendent. At Fox Creek School, students are taught to value learning and respect opinions, people and property. Our students are expected to work diligently to achieve their personal goals while learning to make a difference within a diverse global community. Our school staff believes that all students, our future leaders, are capable of learning and reaching their academic potentials. Using reflective differentiated programming we support the learning styles and needs of our students, recognizing that students learn in different ways and at different rates. We believe a positive school climate relies on school staff, parents and community stakeholders working together to create a variety of educational opportunities in a supporting, consistent, caring and safe environment. We rely on a collaborative relationship among parents, school staff and community stakeholders to invest in education and support school programming. We accept that the school has a contributing responsibility to adapt attitudes, practices and programs to meet the needs of students in a changing society. Fox Creek School is a unique and special K-12 community school. It is unique in that it is the only remaining K-12 school in Northern Gateway Public Schools. It is however a special place to learn and work. Serving a student population of approximately 400 students has some distinct advantages. The dedicated, professional staff know the students very well and understand their strengths, learning styles and interests. We endeavor to provide a positive, caring learning environment where each student will experience success. Regular communication with parents, in and amongst staff makes it easier to provide a supportive nurturing school environment where all students can succeed. Students and staff have access to the latest technology which supports 21st Century teaching and learning. We are extremely grateful to our community partners who support our school in many ways, not limited to financial support, dual credit programs and through volunteer involvement in supporting our extra-curricular programs. The staff of Fox Creek School consistently gives willingly of their personal time to support our school teams, clubs and also support our students involvement in community events outside the school. We are very lucky to have a dedicated, involved School Council who always provide great support for the projects and initiatives in our school community. At Fox Creek School staff are involved in many professional development initiatives within our school, division and beyond. We are always keen to improve our practice and provide a school environment where students are engaged in their learning. Thank you for visiting our school website. We hope you find it informative and we welcome your feedback.